Director – Nicholas Meyer, Screenplay – Edward Hume, Producer – Robert A. Papazian, Photography – Gayner Rescher, Music – David Rackskin & Virgil Thompson, Makeup – Michael Westmore, Production Design – Peter Wooley. Production Company – ABC Circle Films. A war is brewing between the Soviet Union and the US in Europe. As it breaks out, Kansas is hit by a nuclear missile. Afterwards, the various survivors have to cope with food and water shortages and the horrors of radiation sickness, while authorities struggle to find a means of coping with the massive numbers of wounded. The Day After exists more as a controversy than it does as a film. Originally made as a tv movie, it promised to deliver a no-holds barred treatment of nuclear war. However, when news of its themes leaked, rumours about it containing a shocking depiction began to circulate. Advertisers began to withdraw and network executives panicked and started to think about withdrawing the film. To their credit, ABC decided to air the film nevertheless – the last half-hour merely ran without ads. Contrarily, such a rumour mill created a huge buzz that when the film did air it had the biggest audience of any dramatic show in viewing history up until that point. Its’ airing also came accompanied by a huge amount of self-inflated worth – the lack of commercials was piously turned around and made into a statement about the film’s importance; the screenings were followed by on-air discussions about the meaning and implication of what people had just seen; and numerous schools made the film mandatory viewing for classes. Outside of America, the film was released to theatres. Likewise, The Day After was the first of a series of tv productions around the same time that again addressed the horrors of nuclear war, concurrent with the escalation of the American-Soviet Arms Race by President Ronald Reagan. The same year as The Day After also saw Testament (1983), which also went the initial tv movie released to theatres route as this did, and the tv movie Special Bulletin (1983), a startling film about nuclear terrorism conducted as a faux news bulletin, as well as the commercially popular WarGames (1983) about a teen hacker who accidentally triggers a nuclear war alert. These were followed by British entries such as the utterly devastating tv movie Threads (1984), the mini-series Rules of Engagement (1989) and the animated film When the Wind Blows (1986). Sadly, The Day After fails to meet up to such fanfare. Firstly, The War Game (1965), a mock documentary about a nuclear holocaust, made by the BBC eighteen years earlier, had covered exactly the same territory with exactly the same problems with panicking executives, and did it all with far more frightening impact. The Day After comes from director and former novelist Nicholas Meyer, who had previously made the fine time travel film Time After Time (1979) and gone onto great success with Star Trek II: The Wrath of Khan (1982). While these other films show Meyer with a fine grasp of character and drama, The Day After is disappointingly superficial. It is the least accomplished of Nicholas Meyer’s films. Direction often seems hurried, it is badly written and sentimental and filled with shallow characters. There are many characters throughout but their stories seem more vignettes and glimpses rather than they actual stories. Meyer certainly creates often strong images – just seeing the physical decay of the characters; or one sequence where a young girl in a shelter begins to frenziedly kiss the young med-student who has taken refuge with them and the camera pulls back to show the rest of her family watching; another shot that pulls up to show an entire basketball court filled with the wounded; and the nifty special effects of people suddenly being rendered as x-rays when the explosion goes off. However, the film’s problem is that characters are blank identities full of even more banal responses. 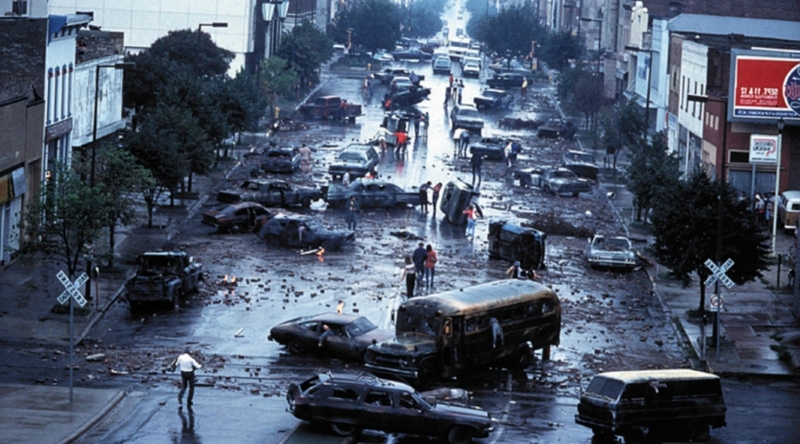 Events happen – bomb explodes, people fight for water – but there is no drama here. Perhaps most obvious is the fact that the film soft-pedals the nuclear holocaust. Meyer simplistically draws on cliches of Midwest Americana – perhaps the reason why the film was perceived to have such shock value is that it sets up what America regards as its emotional heartland and smalltown characters and shows them reduced to rubble. As the end credits note, the attack shown is actually far less devastating than any real nuclear strike would be. 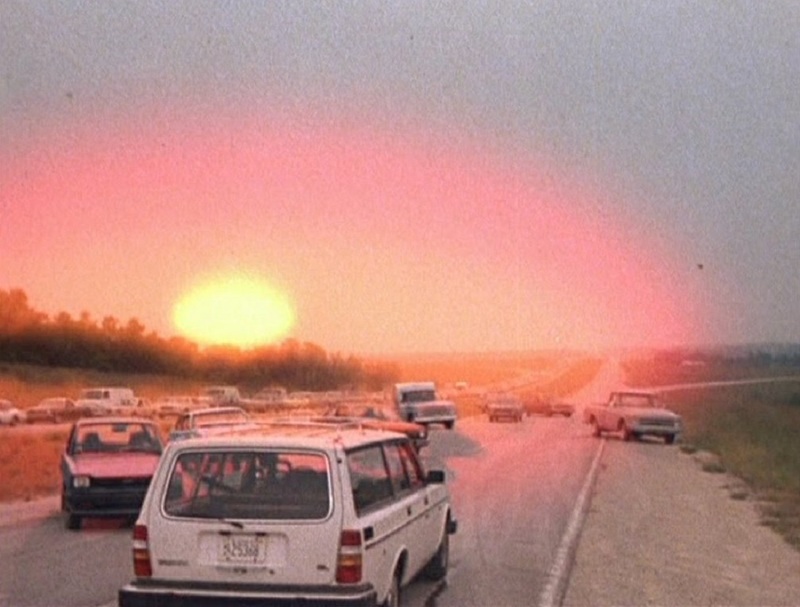 One of the scenes that has proven of great amusement to lovers of the unintentionally ridiculous is Jason Robards’ ability to survive a nuclear firestorm simply by ducking down in the front seat of his car. Nicholas Meyer also directed Time After Time (1979); Star Trek II: The Wrath of Khan (1982), regarded by most Trek fans as the best of the film series; the little seen Merchant-Ivory production The Deceivers (1988) about Indian Thuggee cults; before returning to helm the last of the classic Trek films Star Trek VI: The Undiscovered Country (1991). He has also made a couple of comedies as director, the literary pastiche Volunteers (1985) and the spy spoof Company Business (1991), which did no business. His other genre entries include the scripts for the B movie Invasion of the Bee Girls (1973); the tv movie The Night That Panicked America (1975) about the infamous 1938 Orson Welles War of the Worlds radio broadcast; and The Voyage Home: Star Trek IV (1986). Before he became a director, Meyer was a novelist and wrote the Sherlock Holmes pastiche The Seven Per Cent Solution (1973) in which Holmes meets Sigmund Freud, which was made into a popular film The Seven Per Cent Solution (1976), and followed this with two other Sherlock Holmes pastiche novels The West End Horror (1976) and The Canary Trainer (1993) where Holmes encounters The Phantom of the Opera. From the late 1990s, Meyer moved away from directing to writing scripts such as Sommersby (1995), The Prince of Egypt (1998), The Human Stain (2003) and Houdini (tv mini-series, 2014), plus created the tv series Medici, Masters of Florence (2016– ). He also produced the epic tv mini-series The Odyssey (1997), the Arnold Schwarzenegger action vehicle Collateral Damage (2002) and the tv series Star Trek: Discovery (2017– ).